The VSS Vintorez shoots commonly found 9mm ammo in both semi-automatic and fully automatic firing modes. It’s the least powerful Sniper Rifle in the game, with the lowest bullet velocity, making it very difficult to hit long distance shots. The VSS’s main strength is its suppressor - it’s the most effective in the game. Enemies from a distance won’t have a clue where your shots are coming from! While we don’t recommend using this weapon over a more powerful counterpart, the VSS comes into its own in the late-game thanks to its very quiet shots and surprising effectiveness at closer ranges. Perfect for assassinating targets in the final circle! Currently the only bolt-action Sniper Rifle available as a common drop, the Karabiner 98 Kurz is an excellent long distance damage dealer. Tagging enemies with body shots will hit their health bars hard, while a well placed shot to the head will usually mean insta-death. It’s main drawback is the time it takes to reload a round between every shot, and the lengthy reload time for an entire magazine. This means you’ll have to maintain pinpoint accuracy for an extended period of time as targets flee once they’ve been shot - this isn’t easy. On top of this, it’s also extremely loud. One shot without a Suppressor will give away your position to everyone nearby. Another Sniper Rifle that’s exclusive to Crates, think of the M24 as an upgraded Kar98K. It’s got higher damage, bullet velocity and reload times between each round which makes it much easier to use than its vintage counterpart. Just be wary that if you're used to using the Kar98K, the M24's higher bullet velocity means that you don't need to aim as high when firing at targets in the distance. Without a doubt the most powerful weapon in the game, the AWM devastates anyone unfortunate enough to be on the receiving end of one of its enormous .300 bullets. This Sniper Rifle feels weighty, and every shot thunders out of the barrel at such a blistering pace that there’s hardly any bullet drop, even at extreme distances - it’s like a laser beam. Top of the range helmets don’t stand a chance here. Get clunked in the cranium by an AWM and you’ll be dropping dead to the floor no matter how snazzy your armour is. 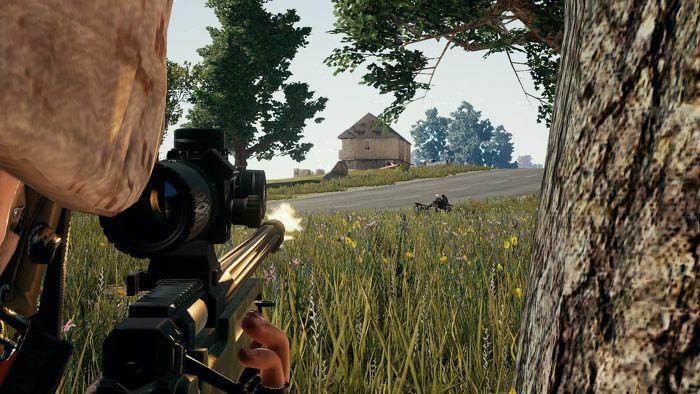 The AWM’s main weakness is its bolt-action, which can make it a pretty unforgiving weapon if you do miss your first few shots. Additionally, it only accepts .300 ammunition that’s found exclusively in Crates. Oh well, you can't have it all eh?